SIGN THE PETITION to Gov. Cuomo and NY Legislators: Fund $40 million to Get Out the Count for 2020 Census! The New York State Legislature will soon negotiate the state budget for 2019-2020, and in 2020 the U.S. census will be conducted. Census data decides how much federal funding New Yorkers will receive, how many seats New York has in the House of Representatives, and what federal, state, and local district lines will look like in the next 10 years. A fair and accurate count helps New York's economy, jobs, schools, medical services, infrastructure, political power, and the quality of life for everyone. 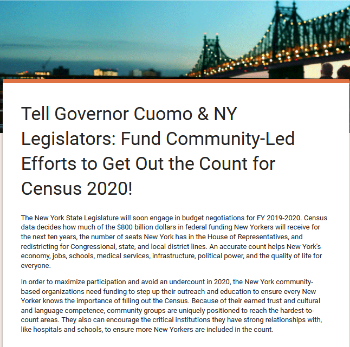 The Trump administration, with its attempt to weaponize the census against immigrants by proposing a citizenship question, has allowed no federal funds for community-led census outreach, so MinKwon and members of New York Counts 2020 are asking all New Yorkers to sign this petition urging Governor Cuomo and NY legislators fund $40 million to Get Out the Count. Our goal is 1000 signatures by April 1st, and we already reached over 400 so far. All New Yorkers deserve to be counted. Sign and share the petition to your communities by April 1st! Copyright © 2019 MinKwon Center for Community Action, All Rights Reserved.